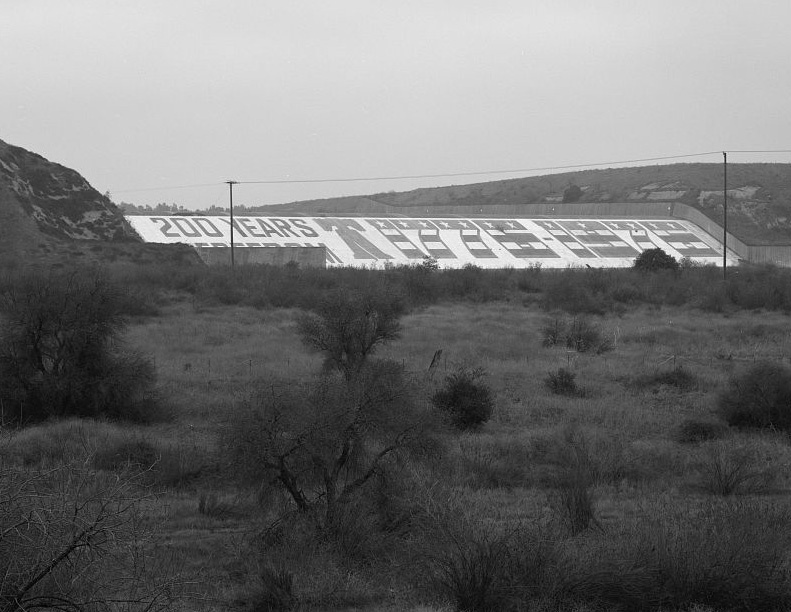 Out in the lands where Los Angeles, Orange, San Bernardino and Riverside counties collide, the “largest patriotic mural in America” is about to be blasted off the Prado Dam spillway in Corona by the Army Corps of Engineers. Those seeking to remove the artwork find themselves up against Friends of the Prado Dam Mural, an alliance of the original artists, local veterans, and the Los Angeles Mural Conservancy. The government engineers cite danger from lead paint, but opponents say the materials have not even been tested. Mayor Eugene Montanez sides with those seeking its removal, telling the Press-Enterprise newspaper that the flag-inspired art “Isn’t relevant now. The bicentennial was long ago.” The Mural Conservancy supports a restoration of the graffiti-damaged artwork and in an online petition the coalition states that they will file an injunction to prevent the destruction. The Army Corps has said they will remove the mural sometime around Independence Day. The contents of a replacement piece have not yet been announced.